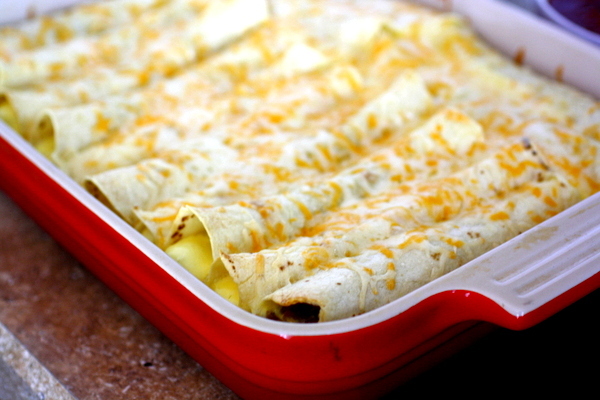 We had a family brunch a few weeks ago after Zeke’s baby dedication at church, and these breakfast enchiladas were on the menu. I was a little nervous to be experimenting with a new recipe when we had company, but I’m so glad I did because it was a huge hit! Everyone loved them. And what’s not to love? 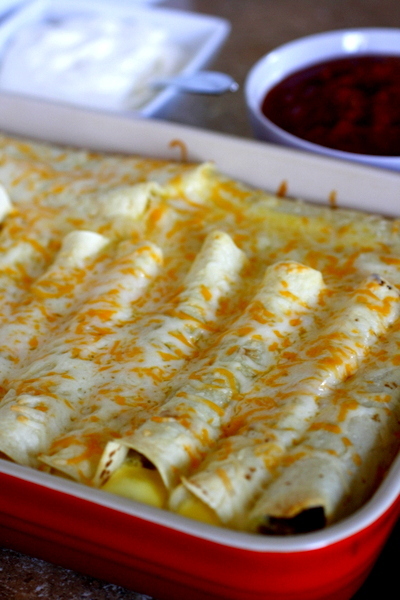 Creamy eggs with sausage and cheese, all wrapped up in a yummy tortilla with even more cheese. Yum!! It’s a fun southwestern take on an egg casserole, and definitely a recipe I’ll be making again and again. It’s a make ahead dish, which is perfect for a busy morning, and I love that you can customize it to your own tastes. I used sausage, but you could easily use bacon or ham instead. Also, fell free to substitute other veggies to suit your tastes. Recipes like this are fun to play around with! This is such a fun and different take on the classic egg casserole, and I can guarantee I’ll be making it again soon. Looking for more egg dish ideas? Check out these recipes! In a large pan, cook the sausage, peppers and onions together until the sausage is done. Let cool slightly. Stir together sausage mixture, green onions and 2 cups of cheese in a large bowl. Use a 1/3-cup measuring cup to scoop out cheese mixture onto a tortilla. Roll up tortilla and place seam side down in a 9 x 13 inch baking dish. Repeat until all the tortillas are squeezed into the pan. Whisk together half-and-half, eggs and flour. Pour over tortillas. Cover and let sit overnight. In the morning, preheat oven to 350ºF. Bake, covered, for 30-40 minutes, or until eggs are set. 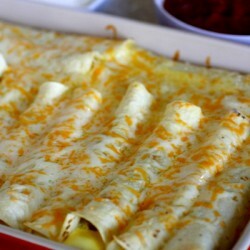 Sprinkle remaining 1/2 cup of cheese over enchiladas and bake, uncovered for 10 more minutes, or until the cheese is melted.